Winners of the Military Health System Innovation Challenge will be announced in mid-February. Winners will work with the Innovation Team to develop presentations that will be bought to Health Affairs/TRICARE Management senior leadership and the services Senior Generals, for potential pilot approval. Challenge.gov winners will also participate in a virtual showcase of other SMMAC approved initiatives, where initiative owners will share experiences and progress on their pilots. This is a unique opportunity to learn about innovation accomplishments within the MHS Community and how winners can encourage this culture of innovation in their local communities. The Military Health System wants to know, how do we further the MHS’s strategic goals by innovating around the Quadruple Aim? In 2012 the Assistant Secretary of Defense (Health Affairs), Dr. Jonathan Woodson, announced a renewed strategy for Military Health System (MHS) Innovation. This strategy will help to continuously improve the care and service provided to our Service men and women, while also supporting responses to the budget questions that the Department faces. The MHS Innovation Strategy recognizes that success will be achieved by supporting the development and sustainment of a culture of innovation within the MHS. 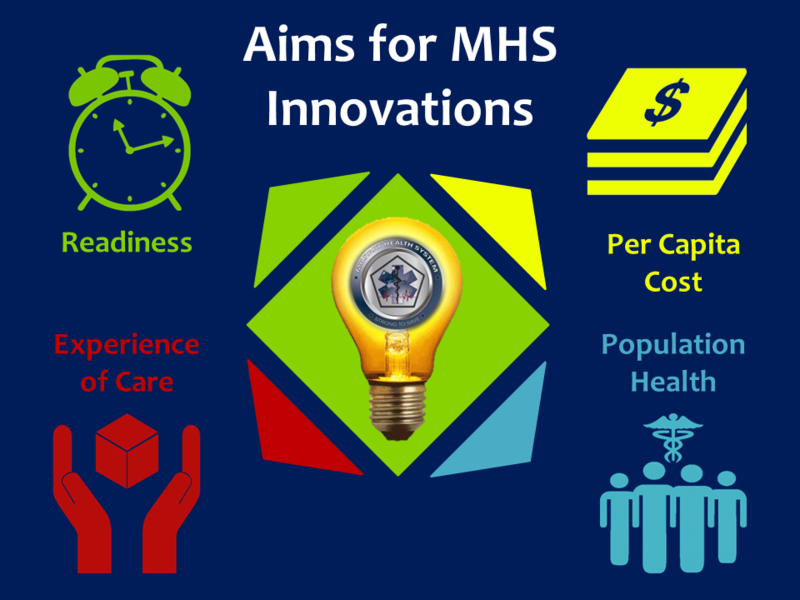 While developing the culture of innovation will take time, the MHS has several tools ready now to identify and fund innovations that support the MHS's strategic goals and Quadruple Aim. MHS Innovation Challenges are a new part of the MHS Innovation Strategy, aimed at identifying innovations that should be piloted and tested in the MHS, for possible diffusion across the entire system. These challenges are designed to be broad reaching and to identify ideas that support furthering the MHS Quadruple Aim. The MHS is using Challenge.gov to support this process to enable crowd-sourcing and knowledge sharing on innovation. Ideas submitted through Challenge.gov are made available for public review; the MHS Innovation team will incorporate public feedback in the review process. Crowd-sourcing tools also enable connections among our diverse MHS community. Readiness: How do we ensure the total military force is ready to deploy? How do we ensure that the medical forces are ready to deliver health care at any time? Population Health: How do we encourage healthy behaviors among all beneficiaries? How do we use preventative medicine to reduce the incidence of illness? Experience of Care: How do we provide the highest quality care that is patient and family centered? Per Capita Cost: How do we bend the cost curve by reducing cost and removing inefficiencies? Submit ideas through Challenge.gov. To submit an idea through Challenge.gov, create an account and then click the "Accept this Challenge" button. What is the title for your idea? How does the idea work? How does it support the readiness of our troops and medical force? What would a small pilot look like? How many pilot locations would be needed? What resources would be used? What does the implementation timeline look like for your pilot? If you have any supporting documents/models, please include them with the submission. The submission must not contain material that violates or infringes upon another’s rights, including but not limited to privacy, publicity, or intellectual property rights; or material that constitutes copyright or license infringement. The submission must not contain any personal health information or personally identifiable information, aside from the submitter. How cost effective is the idea? Will it yield a return on investment? How complex will the implementation be? Will several policy/law exceptions need to be made? Will buy-in from the organization be required before implementation? If the idea is proven to be successful, will it be scalable to the entire Military Health System? Is the idea Tri-Service, or is it Service specific? If it is Service specific can it be modified to support all Services?